A mystery over widespread reports of lights in the sky over southern Germany has been solved by the discovery of a meteorite. A Bavarian farmer's wife found a 3ft wide crater in her vegetable patch with the meteorite lodged at the bottom. Munich Institute for Geology experts estimate the meteorite weighed over 100 kilos before hitting the atmosphere at speeds of almost 125,000mph. The rock is bigger than a tennis ball but can still be held in one hand. It is now at the institute of geology, where officials said it is worth a lot more than the damage caused to the vegetable patch. The woman from Friesing took the blackened rock to the local police station hoping if she reported it she might be eligible for compensation. Although her insurance company have told her she is unlikely to get cash for meteorite damage, she is likely to get a decent reward from the scientists. Police in Bavaria and neighbouring Austria were swamped with calls from worried locals at the weekend. They reported seeing the sky "lit up like daytime" and hearing a violent explosion. The farmer's wife said she witnessed bright flashes of light and heard a loud noise as she put her daughter to bed, but believed it was youths causing a nuisance. The Bavarian interior ministry says hundreds of worried people called to report the UFOs, described as a series of flashes that looked like lightning. A German scientist claims a supposed meteorite found after strange lights were seen over Germany is just an ordinary rock. The tennis ball-sized object was thought to be evidence of a meteor strike in Bavaria. 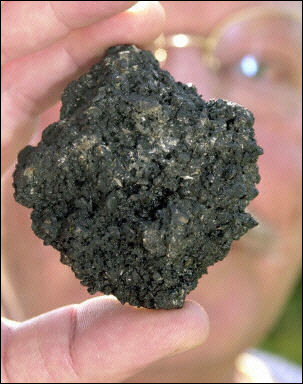 But Dieter Heinlein says it was just slag material which is common in the region. However, he is sure meteorites did fall in the region that night and is now searching for the evidence. A farmer's wife said she found the rock in a 3ft wide crater in her vegetable patch. Officials from Munich's Institute for Geology told the media it was a meteorite. Dieter told Ananova: "I have seen about two dozen specimens which have been brought by people who thought they had found meteorites but no real meteorites have been found yet. It is not easy to search for meteorites but we are hopeful." He has spent 25 years studying and collecting space rocks and has worked for Germany's space and aeronautics agency - the DLR. Dieter is now locating the area in the Alpine foothills most likely to have been hit by the meteorites. He said: "They are interesting because they are extraterrestrial matter which can tell us more about the origins of our solar system." Dieter hopes to measure the radioactivity in the rocks, he said: "The sooner we find them the better chance we have of measuring the short-lived isotopes present in them."